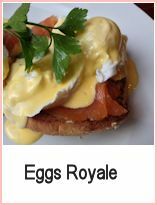 There are links to smoked salmon recipes at the bottom of this page, but let's start with this one - salmon with avocado. 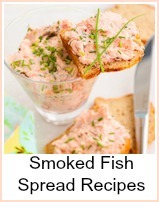 I love smoked salmon - I like it as a sandwich - brown bread and butter with black pepper and lemon - in fish cakes, made into a pate, in a quiche - I could go on. This recipe is better with proper slices - either packs or a small side - about 400g in total. 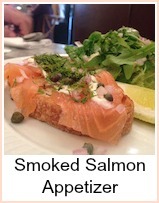 Divide the smoked salmon between four plates. 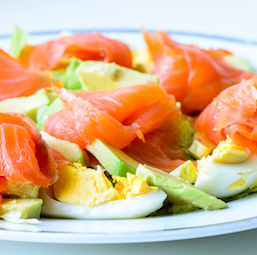 Divide the diced avocado, cucumber and tomato - scatter it over the smoked salmon. Squeeze some lemon juice over and a few twists of black pepper. Serve with a lemon wedge and some thinly sliced brown bread and butter. This would also be ideal to serve as part of a buffet. 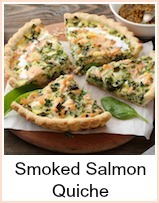 This short video shows you how to make a Crustless Quiche using smoked salmon offcuts. 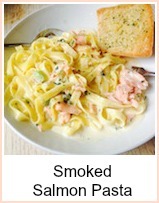 It tastes absolutely gorgeous - it's also Weight Watcher friendly, low carb too. Oven 350F, 175C or Gas Mark 4 for 30 minutes. 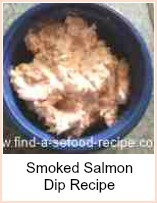 This is the easiest of smoked salmon recipes and makes a great appetiser - salmon with avocado.